Founded in 2014, InvestGlass is a Swiss-based, white-labeled, client and prospect management platform for private bankers and wealth managers. The platform is designed to facilitate more efficient prospecting and onboarding of new clients, as well as the management of relationships with existing clients. Components include a content management system, CRM, and client portal. The company has raised a small seed round but has primarily bootstrapped to this point. They have five people currently, and they are hiring. 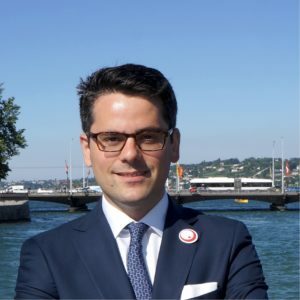 Alexandre Gaillard is the founder and CEO of InvestGlass, and the co-founder of the Swiss Finance + Technology Association (SFTA). He previously worked as head of equity sales at Union Bancaire Privée, as a private banker at Bank of China, and as a Portfolio manager at Levitt Capital Management. InvestGlass is his second startup. Q. Alexandre, what problem are you solving for your clients with InvestGlass? A. We are solving sales automation. The problem of the clients is delivering a service with an added value which justifies their fees. The more you have robo-advisors working against them, the more important it will be for them to empower their businesses with tools that speed up client acquisition and onboarding, and make it easier to manage the books of business. It’s also about delivering relevant information to the client in a compliant way. Q. Which countries and languages are you available in today? A. We are in the UK and Switzerland. The platform is available in English today. We will soon be announcing support for other languages. Q. How big is your target market? A. It’s about 350,000 potential users globally. Q. Tell me about the Swiss FinTech community. Is there much support from established financial firms? From the government? Is the Swiss Financial Market Supervisory Authority (FINMA) on board? A. Initially, things were not so good, primarily due to Switzerland’s commitment to privacy and legacy of secrecy. Switzerland was not very adventurous about trying to build momentum around innovation, which was very different from the behavior you would see in London. But since the beginning of 2015, you’ve had a trend absolutely at the opposite. I would compare this to the arrival of GSM in Nigeria. They went from no phones to phones everywhere. This revolution created new habits in value transfer and payments. Switzerland went from zero associations to seven or eight that I know of today. Maybe a dozen meetups, and some startup bootcamps. Politicians are now speaking about FinTech, and the FINMA is of course very interested to see how the added value is going to shift. We are at that point in the revolution where the typewriter with the carbon paper is no longer relevant. People have printers now. The biggest issue now is what all those secretaries are going to do. As we saw in the ‘80s with the arrival of structured products, and in the ‘00s with EFTs, now it is with digitalization. Support is, I would say, still timid on the part of the government. The FINMA is very, very open. They are welcoming the business models from different companies and they have been very active in blockchain and bitcoin and they have been very active in the crowdfunding/lending space. They take this topic very seriously. The banking industry, to give you an idea, is about 170,000 people, and more broadly, financial services is about 350,000 people out of about 5 million working people in Switzerland. So it’s an important topic. So the FINMA is very responsive. The problem the government has, I guess, is the same as the governments in all European countries have. If you don’t help finance and support new domestic companies, huge American and Chinese companies – well financed – will come. Remember, Uber hasn’t asked for any permission from Geneva or Zurich, they are just here. As our friend Steve Jobs would say, when doing something is easier than thinking, then you have a great product. I can forecast that this will be the case for Apple Pay. Apple Pay has targeted the Swiss market. Our two big national banks spent a lot of money to create their own payment systems. How strange it is now that national newspapers are cursing against this Apple Pay intrusion into the Swiss market. Watch what happened to Alipay in China or Pokemon! A new trend can flood a market in less than six months. Therefore, banks must open their APIs and should collaborate with new comers for the good of Swiss people. Q. What is the general attitude to entrepreneurship and risk-taking in Switzerland? A. The Swiss have more of an East Coast mindset than a West Coast mindset. The West Coast mindset is you shoot first, try to find a freemium model, and then work out if your business model was actually legal. The East Coast mindset is to first contact your lawyer. Then you have a lawyer check the work of your lawyer. Then eventually you start applying for your license. In Switzerland, we are more like the East Coast than the West Coast. The Swiss are great engineers, detailed oriented, fantastic industrialists, but not risk-takers in the U.S. way. But the solar-powered plane is a Swiss based team. I think the mindset of quality and creativity is here. The biggest issue is about indigenous venture funds and financing for the FinTech space. This is a more complex topic, as the venture mindset is not as developed in Switzerland as in the U.S. Entrepreneurs who want to give back to other entrepreneurs – this is not part of the mindset of Swiss business people. You have some angel groups, you have a few good venture firms – I can give you four: Ace and Company; Index Ventures, that one is very well known; Redalpine, which backed N26; and Anthemis. But it’s not the same as you have in the U.S. Access to capital is a big issue for startups in Switzerland. But remember, all of Switzerland has a population smaller than New York City. You wouldn’t want to limit yourself just to VCs in New York. Q. Do the French-speaking and German-speaking parts of the country differ when it comes to entrepreneurship? A. Switzerland is really like four countries. Romansh-, Italian-, French-, and German-speaking countries with different mindsets. It can be so extreme that in Basel they don’t speak the same German as they do in Bern or in Zurich. This can actually be very good for Swiss companies because it’s a barrier to entry for foreign companies. If you come to the Swiss market and you aren’t used to this, it can be very difficult. This is probably why you see Swiss FinTech champions expanding outside the country. At Finovate Europe earlier this year maybe 15% of the presenters were from Switzerland. You need to, because it’s a small market, but working in four languages prepares you for geographic expansion. Switzerland has tremendous infrastructure. Plus, I am only a few hours from London. From Geneva, it takes me less time to get to Canary Wharf than it takes me to get to Zurich. Q. Can you find the talent you need in Switzerland, and if not, can you bring people in from other nations? A. Yes, it is it difficult to find talent. It is an adventure and requires some luck. We are running on a technology that is not so common in Switzerland but that is very common in the U.S.
Now, if I find a woman in Berlin and she is talented and what we are looking for, then we will find a way. But being in Geneva is not the problem. The problem is finding people with the right mindset and right curiosity. Q. Where do you fit from a regulatory standpoint? You sometimes bill the firm as a robo-advisor, but I note that InvestGlass is not an investment advisor, broker or dealer. A. We don’t offer any financial services. We don’t offer any advice. We are just a smart software application you can access in the cloud. You can put whatever you want into the system, but it has not been built to develop advice on its own. The artificial intelligence of InvestGlass builds around workflows and constituencies of your institution. This includes compliance needs, strategies, client beliefs, client goals. It is designed to keep humans one step ahead via automation. Q. Can you support clients of any size? A. Yes, we can. The question really comes down to how strong they are at building their own proprietary solutions. Q. Which countries are you looking at next? A. We are very happy with these two markets, but any U.S. wealth management firms that are interested in talking should reach out. Our platform is applicable anywhere in the world. Workflows are the same everywhere and the artificial intelligence is truly customizable to adopt cultural singularities. Q. To do this successfully, you need to have a deep understanding of financial advisor workflow. Where does this expertise come from? A. Everything started with the trauma I felt during the 2008 crisis. Bear Sterns collapsed, my colleagues’ retirement plan vanished, and CNBC’s famous “POWA journalist” was encouraging investors to hold BS stocks…I felt the power of media and customer centric needs. I studied behavioral finance at Sorbonne HEC IAE and then figured how to build a hyper-targeted content machine. At the same time, I was working for Bank of China, Union Bancaire Privée which confirmed the need of a new generation of tool. Q. How many private banking clients do you have today? A. We have 60 clients today, including the Swiss banking group SYZ. We also have several pilots running with private banks whose names I cannot yet disclose. Q. How much of your business is B2C? A. None. We believe if we worked directly with investors their Do It Yourself approach would value the transactional aspect more than the rebalancing, risk management and investment proposal features. We would need to be regulated then. Our clients are wealth advisors. Q. Which custodians are you working with? A. We can work with any custodian. This is not a problem. Q. Do you aggregate client accounts? A. We don’t aggregate client assets from third parties. We only consider assets that are held by the banks’ custodians. Q. Discuss your approach to AI. A. The concept itself is very simple. What we try to do is to deliver hyper-targeted content with AI which will help clients attain greater customer responsiveness. We use rules – workflows – that bankers are using ­to optimize and make sure that they are addressing investment proposal to their clients in a fashion that is compliant and convincing. We are using the exact same type of workflows that bankers are using, but we blend the CRM, CMS, and the market quotes all together, which makes us unique compared to competitors. For news feeds, we use a system of rules and client preferences similar to what you would experience on Amazon, Tinder, or Netflix. It’s similarities, it’s filtering, it’s clustering. The machine tells you that if a particular client likes this, they might like that as well and then prioritizes information. Relevancy is crucial in a world where attention is a scarce resource! Q. Which data feeds/news sources do you offer out of the box? A. We have all the major data sources, including exchanges (like Turquoise, Euronext, SIX, and LSE), Morningstar, IDC, Quandl. Same for news. We are able to integrate any news or data sources a bank or advisor is already using, including, if they have an asset manager or a hedge fund, their own historical data or risk metrics. One thing we sometimes encountered in the beginning is clients not knowing what they are already paying for. We are not yet at the level of a Bloomberg, but we are very serious about content and we are very serious about feeds. Q. Are European private banks ready for a cloud-based solution? Are they comfortable integrating their back-ends with a company that operates in the cloud? A. Some of them are, while others still don’t really understand. Some are serious and some are just fooling around. Q. How receptive is the European wealth management/private banking industry to innovation? Does it vary by country? A. The European scene is very different from country to country. In Switzerland, the return on client assets realized by private bankers is a bit different from the one you have in the UK. A solution like InvestGlass is highly relevant to wealth managers who are interested in increasing their return on those assets. There are people who are interested in doing so they will spend money to do it. It depends on how serious you are about retaining your clients, how serious you are about acquiring new ones, and how serious you are about putting them at the center of your offering. Everyone will say that they are client centric, but the reality is that this is not so. Q. What does your pricing look like? A. CHF 850 per user per month. We offer a discount to large corporate deals. Q. How important is mobile to private bankers and their clients? A. The site is responsive, and can be viewed from any screen. Q. I understand you are raising capital. A. Yes. We would like to raise CHF 2.0 million to fund further expansion. We plan to start the process this fall. Q. We met at Finovate in New York several years ago when we happened to sit next to each other. You presented at Finovate Europe in London earlier this year. What do you recommend startups do to maximize the value of their participation? A. I advise my entrepreneurial colleagues to try it at least once. But make sure you are presenting for the right reasons. It is a fantastic marketing exercise, but make sure that the audience is going to be relevant to you if you are there to do business. This entry was posted in FinTech, Startups, Wealth Management and tagged InvestGlass, Switzerland by jim. Bookmark the permalink.